Ted Swartz was only half of the acting duo, which for 20 years, was known as Ted and Lee TheaterWorks. But that abruptly changed when his acting partner, Lee Eshleman, took his own life in 2007 as a result of clinical depression. Since then, Swartz has avoided directly addressing the death of his friend in his productions, though he has addressed some of his emotions. His newest production, though, “Laughter is Sacred Space,” tackles the issue head-on. “What we’re hoping that this show will do is open up discussions about mental illness and suicide,” he said. The topic of depression and suicide – the “unforgivable sin” – isn’t often discussed in the church, says Swartz, a devout Mennonite who initially studied to become a pastor. Ted graduated from Eastern Mennonite Seminary in 1992. But the production is also a sort of “gift” for audience members who felt they got to know Eshleman during his two decades of acting, Swartz said. “What you’re doing is, you’re revealing yourself from the stage to people and, if you do it well, they feel like they know you,” he said. The show, set for 7:30 p.m. Sept. 14 and 15 at Court Square Theater, comprises three parts. 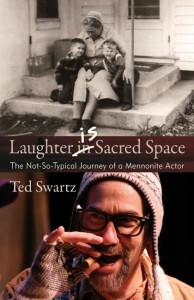 The first covers “what it means to grow up Mennonite,” acting and how the two converged in Swartz’s own life. The production is a rewrite of an earlier show Swartz had written in 2008. 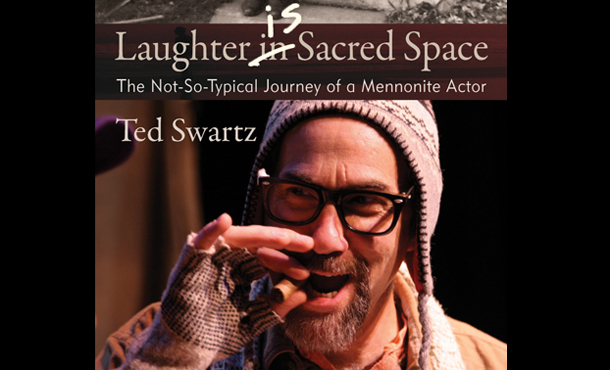 “Laughter is Sacred Space” will debut the same weekend as his book, “Laughter is Sacred Space: The Not-So-Typical Journey of a Mennonite Actor,” is set to be released. The book, to be published by Herald Press, the book publishing arm of MennoMedia, will largely complement the show, which Swartz said he hopes to tour for several years. While the one-man show covers some pretty sensitive material, it is Swartz’s openness about the topic that makes it such a “moving” production, she said.